Kinshasa, 10 January 2008 - Mr. Alan Doss, the new Special Representative of the Secretary General of the United Nations in the Democratic Republic of Congo (DRC) and head of MONUC, the UN Peacekeeping Mission in the DRC, arrived yesterday evening in Kinshasa to take up his new duties. Mr. Doss, of the United Kingdom, whose nomination by the United Nations Secretary General Mr. Ban Ki-moon was officially announced on 24 October 2007, replaces Mr. William Lacy Swing of the United States. 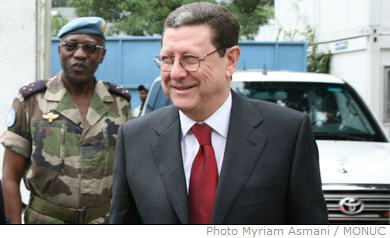 Mr. Doss, who was UN Special Representative for Liberia since 2005 in his previous post, also served as Special Representative of the Secretary General for the Ivory Coast in 2004. He was also Special Representative of the Secretary General for Sierra Leone where he was also the United Nations resident coordinator, humanitarian coordinator and resident representative of the United Nations Programme for Development (UNDP). During his career, Mr. Doss also directed the United Nations Development Group (UNDG). Previously, he was director of the UNDP office in Geneva, with the mandate of reinforcing public relations and communications work in Western Europe. He was also regional UNDP Representative in Bangkok, while being responsible for aid operations in favour of the Kampuchean refugees at the border of Kampuchea and Thailand. Earlier in his career, Mr. Doss worked for the United Nations in China, Kenya, Niger, Zaire (now DRC) and Benin. Married and father to three children, Mr. Doss was born on 7 January 1945 and was raised in Cardiff, Wales. He is a graduate of the London School of Economics.